Other names: Kieffer lime, limau purut. Kaffir lime is a fruit of South East Asia. It is believed to have been originated in Thailand, Laos, Indonesia or Malaysia. It bears very bumpy fruits which are very aromatic. The fruits are too sour to be eaten fresh but are very widely used in the cuisine of nearly all the countries of the South East Asia. This lime has two unique characteristics. The fruits are very rough and bumpy from outside. The leaves are “twin” due to the presence of a large winged petiole. Evergreen thorny tree, 2.5-3 m tall, trunk and branches bearing strong and sharp spines which are upto 4 cm long. Leaves blunt-pointed, usually of medium size, 8 to 12 by 3 to 5 cm, more or less irregular at the tip and sometimes slightly emarginated; margins are more or less crenate; petiole winged, usually two-thirds to three-fourths as long as the leaf blade, broadly rounded and blunt at the base, often subtruncate at the tip, often with more or less crenate margins. Flowers small, stamens short, entirely free. Fruits very bumpy or tuberculate, 4 cm wide, segments 10-12, pulp-vesiccles provided with a slender very long stalk which suddenly enlarges toward the free end, forming a small round or oval body pointed at the tip, yellow at maturity. The fruits are not directly eaten. The aromatic rind is used and leaves are used in various dishes in Burma, Thailand, Cambodia, Indonesia etc. 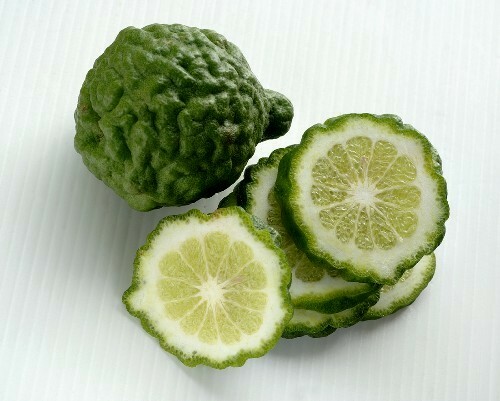 The juice and rind of this lime are widely used in traditional Indonesian medicine. 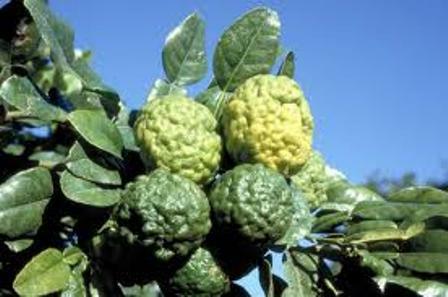 So in Indonesia, kaffir lime is called jeruk obat which literally means “medicine citrus”. The oil from the rind also has strong insecticidal properties. 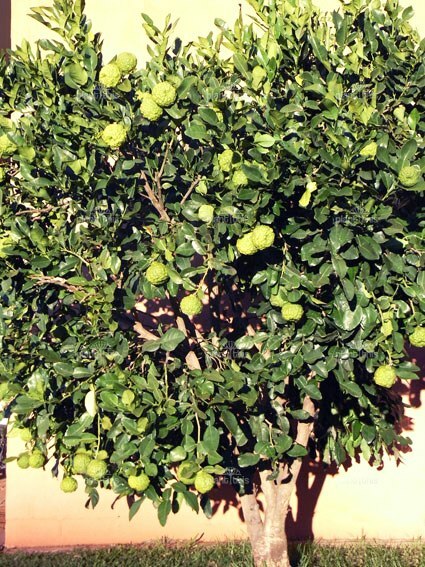 Kaffir lime is widely planted as a backyard tree. 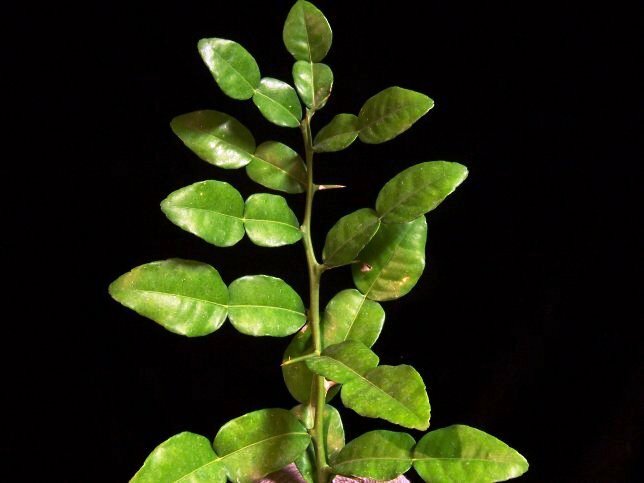 It is a very hardy plant and does not require any special care. New plants can be raised from seed as well as from cuttings.